Released in October 2000 for the exhibition "Sehstörungen," Sound Tubes was among fifty works presented in public space. This piece was installed in an archway under the tracks of Mönchengladbach's central railway station. Suspended tubes with loudspeakers projected sequences of bell-like sounds in pairs. Through four spatially interlocked stereophonic sources, the chance distribution and combination of these impulses produced acoustic effects: sounds repeated in clusters or traveled along the tunnel's arch. These tonal movements curiously enriched the noisy atmosphere of the station. At the same time, they irritated the passengers' strides, their steps becoming unconsciously synchronized to the sonic impulses. Along with Organum, GlockenKlangGlocken is another installation that deals with the sonic events within a church. Suspended from the nave with rods, two inverted metal bowls become pendula that alter the sonic spectrum of a speaker underneath, which projects sound at random. As the pendulum kinetically evokes a swinging bell, the mechanized sound events can be regarded as an electronic adaptation of an automated glockenspiel. In late medieval times, the mechanical movements of the glockenspiel was a metaphor the cosmos, representing the Pythagorean concept of a universe based on musical harmonies. Rejecting automation and musical movements that combine a mechanistic view of the world and the myth of spherical music, GlockenKlangGlocken eludes synchronized clockwork with the aid of chance operation. This method effects harmony, dissonance, and silence - therefore, noise - which underlie today's perception of a world created through chance and chaos. Laszlo Moholy-Nagy speculated in 1923 on the possibility of transferring graphical structure courses on a record in order to reach new sounds, sounds that were never heard before. Even if this procedure proved not to be realizable, Moholy-Nagy nevertheless voiced substantial thoughts on the nature of this sound medium as a surface to be inscribed. In principle the storage of sounds on a record is inscription in the original sense. The analogue sound information is input with a graver on a sound medium, which then is used in turn as a matrix for duplication. The storage of acoustic information on a record thus does not differentiate fundamentally from the process of writing. The manual inscription of a record is therefore essentially possible. The character that has been carved, scratched or embossed on the surface, the grapheme, mutates on a record to a graphon. The possibility of surface deformation, making the storage of information on a record at all possible, led to the abolition of the latter, as we today know. The carrier surface has also always been unprotected towards further damage. Record fetishists still bemoan the passing of these traces, a scratched record did indeed also provide information on the unique history of its use. Actually a scratch is the most immediate inscription of a record, the unintentional damage as a constant new inscription of the medium. Graphons of wear and tear, that can be made to ring. 'orbis mechanicae' is an acoustic, literary work on the historical role of the machine. While the room is filled with spherical music originating from the electronically and manually manipulated sounds emitted by small musical boxes, positioned in four different corners of the room, literary quotations of Descartes, Leibniz, Marx, E.T.A. Hoffmann amongst others, can be heard on the subject man and the machine from four further positions of the room. As currently with the computer and the internet, the machine had been an object of lively discussions, from classical antiquity up until the first half of the twentieth century, whereby the foremost aspect had been the relationship of man and the machinery created by him. Time and time again the machine served philosophers and writers as a metaphor for the cosmos, for authoritative and state structures and finally for man itself. 'Orbis mechanicae' is consequently also a documentary work which tries to explain the way in which the relationship between man and machinery has been treated in the philosophical tradition. Simultaneously the work reflects the relationship between art and machinery, as digital sound manipulation combines with the mechanical musical box as the oldest form of technical music reproduction. 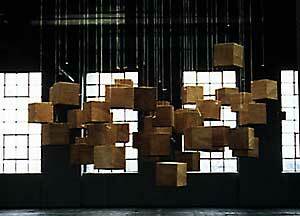 The musical boxes are altogether forty, hanging in grape-like clusters from the ceiling. It is almost anachronistic when the interactive intervention of the observer into the work is made possible through the musical boxes, and indeed not through the help of computers. Thus the observer, as a musical box player, is made to an element of a randomly steered spacial composition. 'Organum' is a resuscitation of "acoustic" objets trouvés. 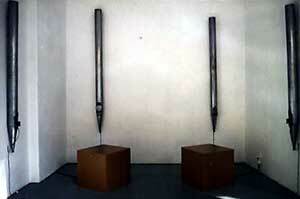 In the sound installation four big organ pipes play into a room from different corners. The sound of the pipes is reactivated through four loudspeakers, which are sunk in the pipes. 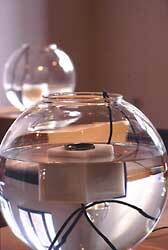 These play, electronically, the original sounds of the pipes back into the body of resonance. Thus a four channel sound mixture is created that is very remote from the traditional sound of the organ. The minimalistic interplay of the sounds forms an archaic sound expanse, which reminds listeners of the ritual music of Tibetan Buddhism or of fog-horns from ships in harbour areas. At the same time 'Organum' is an acoustic dice game, as the sound materials, randomly played from four corners of the room, mesh with one another. The random combination of sounds stretch the puristic sound material into a diversity of acoustic phenomena. In this way sound hoverings arise again and again next to the many and diverse motions in the room. These nearly become physically perceptible to the listening observer. In addition to that changes of volume and the gradual swelling and fading of the sounds originate a multitude of subtle tonal colours. is the title of a series of sound installations I set up in my private surroundings. These installations are based on the idea that the domestic environment is acoustically shaped by household appliances. The emission of tones and noise, often of musical quality, usually remains imperceptible because of low volume. In 1997, I developed an installation for a ceiling fan, another for a gas heater, and one for a refrigerator, under this general title. Each object was equipped with an amplifier, loudspeakers and digital players. The sounds were recorded, slightly manipulated (through acceleration, reverberation, or interruption), and then played back next to their original source. The actual sounds of the appliances began to interact with each other and their subtle alterations, thus becoming musically enhanced. Appliances 1 is an installation for a nearly 30-year-old Bosch refrigerator. While such appliances are antiques high in demand today, I was fascinated by the pleasant sounds most of the older refrigerators produce during the cooling process. Each of these appliances sounds slightly different, but all have in common this low frequency that is characterized by interesting overtones, if regarded carefully. Gas heaters, equipped with thermostats, were set-up to automatically switch on and off. When gas is supplied to the appliance and it began to heat up, one could hear rhythmic sounds of great variety and complexity. This is particularly the case with older metal bodies. When heating up, the expanding material produces cascades of cracking sounds, before losing density during the process. The sonic event moves from a chaotic condition to a regular juxtaposition of different pulses. If a well-heated appliance is suddenly switched off, the cooling creates the same effect backward in a similar time frame. For Appliances 2, a recording of the previous process was divided into 18 segments, augmented with varying echoes, digitally recorded, and then played at random next to appliance after it is put in operation. Appliances 3 was a sound installation for a fan under a false ceiling in an old apartment building. 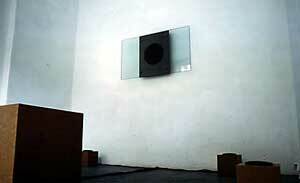 During operation, the fan created a bass tone that is amplified through the empty space above. A recording of that gentle humming was the primary material for the installation, and a digital editing machine processed the tone in scales. The original noise was isolated as the base, and seven intervals were derived from it. All 8 tones were then transferred to a digital player that randomly played them back into the space with the ventilator.